It's difficult to give money away. You have a client with a high income year and facing sizable tax burden. Your client wants to be charitable but anonymous. Your client wants to wrap everything up and retire out of state. Any of the above is a good reason to partner with the Community Foundation of Grundy County to provide a comprehensive service to your clients. If the conversation turns to philanthropy and charity, please include us. If you are not comfortable discussing charity with your clients, we can help. All client/donor conversations with us are confidential. Not sure how a particular situation would work? 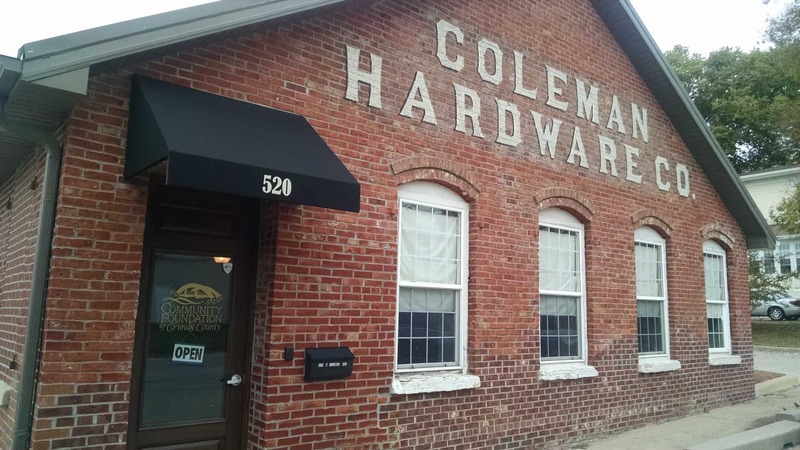 Give us a call - we can help! If you have a client who wants to set up a charitable fund here, you can retain it as an account at your place provided that the fund is at least $250,000 and that the account complies with our investment policy. This is a win-win for everyone - your clients benefits from your guidance and our grantmaking services, you keep a client, we gain a new fund, and the community gains more grants to improve our quality of life! Click here to download the infographic "How Does the Community Foundation of Grundy County work?" Because Private Foundations have a 5% minimum distribution each year plus heavy reporting requirements, a good rule of thumb is that private foundations are burdensome for anything less than $5 million. Please explore setting up a Donor Advised Fund instead! 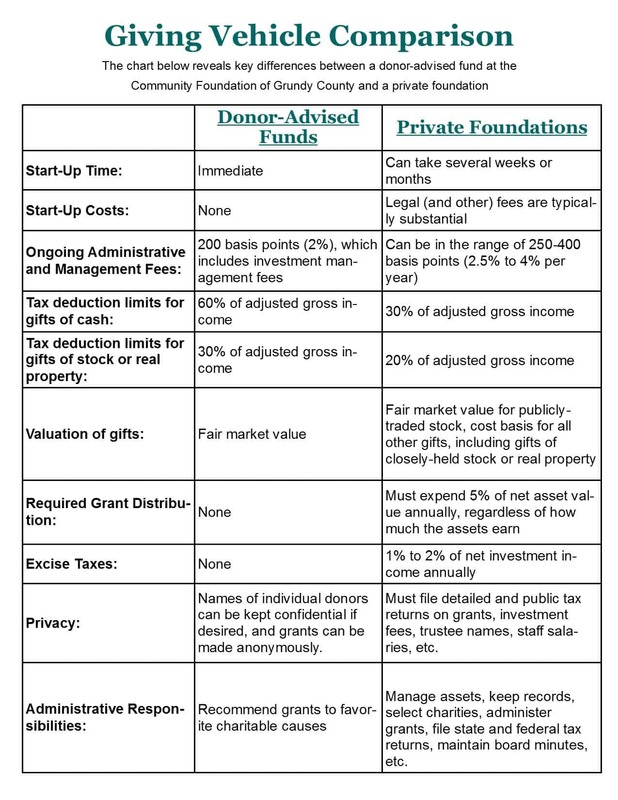 Click here to download our infographic "DAF vs Private Foundation"
The goal of CFGC is not to steal your clients but to instead help you enhance the services that your provide. If you're looking for a way to start the charitable conversation with your clients, we recommend Tracy Gary's "Inspired Philanthropy" series of worksheets. You can order her book from Amazon, or stop by our office for a free copy, and/or download her worksheets for free from her website. If at any time you would like us to join the conversation, we are happy to join you. It's your client and we are happy to be your philanthropic expert! Grundy County is small and rural where everybody seems to know everybody else's business. And nonprofits have a habit of pouncing on a donor after even the smallest gift. Not at the Foundation. We already steward funds where the donor has chosen to remain anonymous. We can do this for your clients, too! One way to start is by working with your client to complete a "New Fund Questions" form. Instead of using the client's name you can use your name followed by "for a client." Fund names can have anonymous names so that the public nor the nonprofit receiving the grant knows the origin. Your client's identity can even remain anonymous to us - call and ask us how! Do you have a client wanting to beat the end of the tax year with a last-minute charitable donation? If your client doesn't yet have a donor-designed fund here, we can help you get one set up in a matter of hours. All of our fund establishing documents are in template form. To get the process started, complete a "New Fund Questions" form, using that we fill in the template blanks, email the document to you to review with the client, get it signed and returned to us, transfer the asset to us, and it's done! We're even open New Year's Eve Day to provide this service! Creating or adding to an existing Donor Advised Fund is a super fast way to beat the year-end rush. That's because Donor Advised Funds allow you to donate now, take the immediate tax deduction, and grant later. So if your client is undecided on a charity, they can donate here and grant later. "IRA Charitable Rollover" - If your client is age 70-1/2, they can make distributions from an IRA and that distribution will not be counted as income for tax purposes. This distribution CANNOT go into a Donor Advised Fund, but it can go into a Designated Fund for a specific charity. Please call us for more details. Jim and Carol Baum want us to help spread the word that it's easy to support your favorite charities after your lifetime by leaving a portion of your estate, including specific instructions, to the Foundation. Please click here to download the Sample Will from the Baum estate plan. Ron used to donate gifts of stock to his favorite charities each December. He would sit down each year and look at which stocks to give, then look at the market and decide how many shares to give each charity on which day to equal a dollar amount close to his gift goal, and rarely did that end in even numbers. AND his favorite charities had to have the capacity to accept and sell stock. And we all know that timing the market is not an easy task! Instead, Ron learned that he can transfer a block of stock to the Community Foundation of Grundy County, we'd liquidate it and deposit the cash into his Donor Advised Fund. He'd get the charitable deduction, then instruct us where to send grants...in nice, pretty, even dollar amounts. And Ron didn't then have a shoebox full of receipts to take to his accountant each tax time - he just had a single receipt letter from us. And he's been doing it ever since! We solved a problem and provided a service. We made the donor happy by streamlining the tasks associated with his year-end giving. We made the brokerage firm happy by streamlining the number of stock trades they had to process. We made the charities happy by sending them a simple grant check rather than a block of stock that they'd then have to sell. We made the accountant happy by eliminating Ron's shoebox of receipts! We can do this for your clients, too!